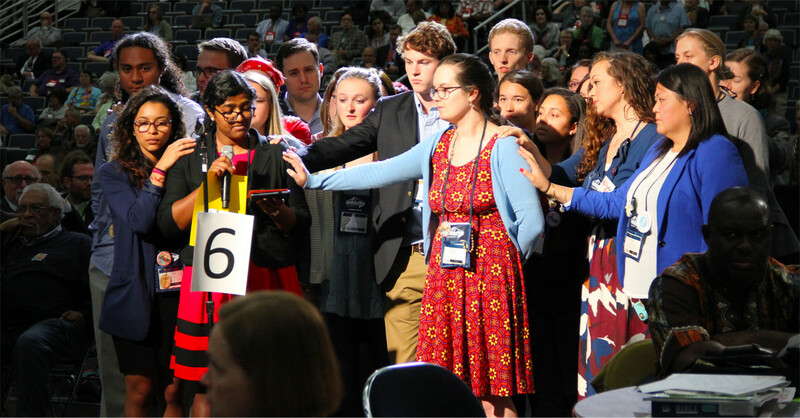 This statement of unity was read by Ann Jacob, a young adult reserve delegate from the Eastern Pennsylvania Conference, on the floor of the United Methodist General Conference today. It was shaped by the work of over 300 United Methodist young people from 34 countries. It was received with a standing ovation. Statement of Unity from GYPCLA 2014 read on the floor of General Conference 2016 by Ann Jacobs. Photo by Teri Tobey for the PNW Conference. By The Global Young People’s Convocation & Legislative Assembly Manila, Philippines. Ann is also co-chair of the Division on Ministries with Young People, who organize GYPCLA, which is the event from which this statement of unity came. Please correct the Wesley quote – to be one in the unity of the heart even if not unity in opinion . Thank you Randy. We are unable to change it because that was the text as approved by the young people at the G.Y.P.C.L.A. gathering in 2014. Allowing what God has undeniably condemned? Our responsibility as faithful Christians is not only to spread the message of God’s love and do good, but to also uphold his standard of what is moral and immoral sexually. The Bible is crystal clear on this issue. I cannot call clean what God has said is filthy morally. Is it now more important to accept everyone, than it is to be faithful to God and his standards? Christ never hesitated to condem sin, telling sinners to “Go, and sin no more.” The Methodist Church must decide whether they are more worried about pleasing God or offending and then losing some of its members/money. The Bible is not “crystal clear” on most issues. It is only so for those who chose to select passages which support their particular bias. The Bible is not there for proof texting but as a guide for persons who wish to understand the unveiling of our human struggle to search for the will of the “source” of our Creator from whom all of creation has evolved. To presume to know the ultimate will of that Creator is to exhibit an arrogance that far exceeds the authority of writings which have been an instrument in the unveiling of the Creator’s Design but which have not been the final Word. Elizabeth needs to do some reading in John Wesley who used an incident between Jehu and Jehon’adab in his sermon on the “Catholic Spirit” found in II Kings 10:15 in which he quoted, “Is your heart as mine is to yours?” And Jehon’adab answered, “it is.” Jehu said, If it is, give me your hand.” I don’t believe for one minute that “The Methodist Church . . . is more worried about pleasing God or offending and then losing some of its members/money.” I would be naive if I said the above quote is not true since there is an element of truth in it. However, as a UM Minister of over 50 years, I take offense that it has been or is the focus of my struggle or the struggle of my congregations to understand, live out and communicate the will of the God of Love to all.